Summer Camp in Lawrenceville - Cruse Road | Discovery Point Cruse Rd. Discover Our Exciting Summer Camp Opportunities in Lawrenceville on Cruse Road! Are you looking for a way to ensure that your child has a blast this summer? 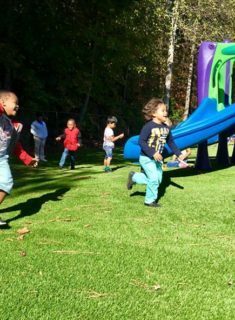 At Discovery Point Cruse Rd., our summer camp for children in the Cruse Road area of Lawrenceville offers plenty of opportunities for summertime fun. We focus on providing hands-on activities that inspire children to build relationships, develop important skills, and learn more about the world around them. Campers can look forward to new and exciting themes every week, as well as fun field trips and competitive challenges. Read on to learn more about how we can help your child make some wonderful memories this summer. We’ve designed this year’s summer camp program in Lawrenceville on Cruse Rd. to integrate learning and fun through literature-based lessons that inspire weekly themed adventures, which we refer to as “mighty missions.” These missions include dynamic activities and excursions that help campers discover their sense of adventure and the hero within. We’re excited to touch on a number of topics to spark children’s interest and keep them engaged, from dinosaurs and meteorology to unsolved mysteries and animal rescue. Throughout the ten weeks of our program, campers will have a blast while learning that they can develop their true superpowers by practicing values like sportsmanship, kindness, self-esteem, and creativity. Give your child the opportunity to experience the full potential of the summer season with our exciting summer camp program. Contact Discovery Point Cruse Rd. at (678) 376-9760 today or stop by our child care center in Lawrenceville on Cruse Road to hear more about what we’re offering for summer 2019.